18 • FOODSERVICE EQUIPMENT & SUPPLIES • NOVEMBER 2018 a pro you should know I also love going into kitchens and talking to everyone from the most seasoned employee who has been there the longest to a new chef who just moved there. 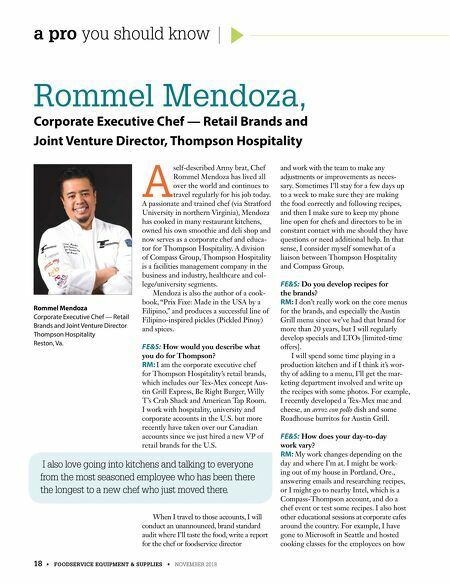 Rommel Mendoza, Corporate Executive Chef — Retail Brands and Joint Venture Director, Thompson Hospitality A self-described Army brat, Chef Rommel Mendoza has lived all over the world and continues to travel regularly for his job today. A passionate and trained chef (via Stratford University in northern Virginia), Mendoza has cooked in many restaurant kitchens, owned his own smoothie and deli shop and now serves as a corporate chef and educa- tor for Thompson Hospitality. A division of Compass Group, Thompson Hospitality is a facilities management company in the business and industry, healthcare and col- lege/university segments. Mendoza is also the author of a cook- book, "Prix Fixe: Made in the USA by a Filipino," and produces a successful line of Filipino-inspired pickles (Pickled Pinoy) and spices. FE&S: How would you describe what you do for Thompson? RM: I am the corporate executive chef for Thompson Hospitality's retail brands, which includes our Tex-Mex concept Aus- tin Grill Express, Be Right Burger, Willy T's Crab Shack and American Tap Room. I work with hospitality, university and corporate accounts in the U.S. but more recently have taken over our Canadian accounts since we just hired a new VP of retail brands for the U.S. When I travel to those accounts, I will conduct an unannounced, brand standard audit where I'll taste the food, write a report for the chef or foodservice director and work with the team to make any adjustments or improvements as neces- sary. Sometimes I'll stay for a few days up to a week to make sure they are making the food correctly and following recipes, and then I make sure to keep my phone line open for chefs and directors to be in constant contact with me should they have questions or need additional help. In that sense, I consider myself somewhat of a liaison between Thompson Hospitality and Compass Group. 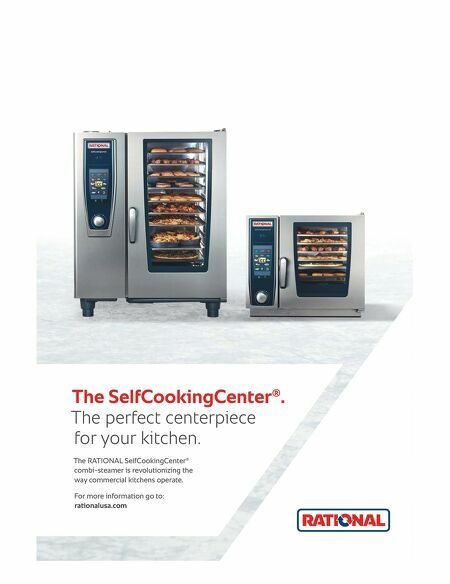 FE&S: Do you develop recipes for the brands? RM: I don't really work on the core menus for the brands, and especially the Austin Grill menu since we've had that brand for more than 20 years, but I will regularly develop specials and LTOs [limited-time offers]. I will spend some time playing in a production kitchen and if I think it's wor- thy of adding to a menu, I'll get the mar- keting department involved and write up the recipes with some photos. For example, I recently developed a Tex-Mex mac and cheese, an arroz con pollo dish and some Roadhouse burritos for Austin Grill. FE&S: How does your day-to-day work vary? RM: My work changes depending on the day and where I'm at. I might be work- ing out of my house in Portland, Ore., answering emails and researching recipes, or I might go to nearby Intel, which is a Compass-Thompson account, and do a chef event or test some recipes. I also host other educational sessions at corporate cafes around the country. For example, I have gone to Microsoft in Seattle and hosted cooking classes for the employees on how Rommel Mendoza Corporate Executive Chef — Retail Brands and Joint Venture Director Thompson Hospitality Reston, Va.